The lyrics to Alanis Morissette's classic break-up anthem "You Oughta Know" are rewritten to be about people and things that famously "broke up." Next, we'll play a music parody game about breakups. Breaking up with someone over text is so cold, OK? The right way to do it is in person on Valentine's Day. EISENBERG: Let's meet our contestants. First up, Roo Kulshreshtha. You're studying clinical psychology. And you're a successful matchmaker. Three introductions you've put together have turned into weddings. EISENBERG: OK. So what's your secret to matching people? KULSHRESHTHA: Being friends with people who are kind of desperate helps. EISENBERG: Fantastic. Roo, when you ring in, we'll hear this. EISENBERG: Your opponent is Sara Petit-McClure. You're a Ph.D. student studying special education. So as a older Ph.D. student, you've said that you have a different set of challenges than your average classmate. What are some? SARA PETIT-MCCLURE: Well, trying to understand the 27-year-old mindset, sometimes, is a little bit challenging. PETIT-MCCLURE: But overall, it's - it helps me stay in the know with what's the hip trends right now. EISENBERG: OK. What are the hip trends right now? PETIT-MCCLURE: There's a phrase that some young people are using, at least in Syracuse, that someone - when you think they're attractive, they're called a snack. PETIT-MCCLURE: And that I had never heard before. So that was a new one. PETIT-MCCLURE: I had to have it explained to me. It made me feel pretty old. EISENBERG: That does sound very temporary, though, I got to say. PETIT-MCCLURE: (Laughter) Yes, yes, for sure. EISENBERG: That sounds like just a swipe left and then you're done. EISENBERG: Sara, when you ring in, we'll hear this. EISENBERG: Remember, Roo and Sara, whoever has more points after two games will go to our final round. Your next game is a music parody called Breaking Up. Jonathan Coulton, take it away. 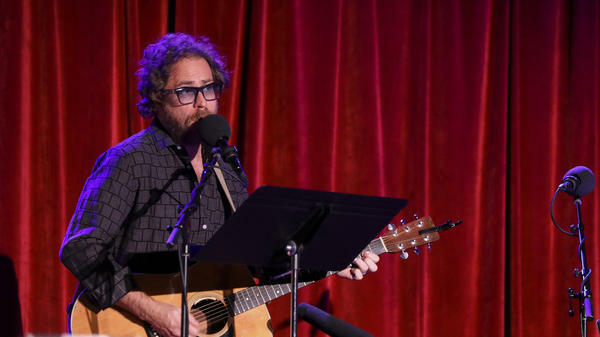 JONATHAN COULTON: We rewrote the post-breakup song "You Oughta Know" by Alanis Morissette. And now the lyrics are about things or people who broke up or are breaking up. Just ring in and identify what I'm singing about. You ready? COULTON: OK. Here we go. (Singing, playing guitar) I want you to know that they were a blues band named after the guy who bangs on the drums. Then there was Christine McVie. She's married to John McVie. They got divorced. These are not just rumors. And then there's also Stevie, who ended things with Lindsey. It's like a soap opera for soft drunken (ph) boomers. COULTON: Fleetwood Mac is correct. COULTON: (Singing, playing guitar) 'Cause the sheets that are frozen, the floes they are showing, ungrowing (ph) in regions of high latitude. No. And all those seals and bears and whales have to move because the sea level's rising. They're really screwed. Yeah, they're screwed. And we're also screwed. COULTON: Yes, the ice caps is what we're looking for. That's right. EISENBERG: Now, if the caps are melting, are they still caps? Just a question (laughter). Or they're more blankets? COULTON: Yeah, they're more blankets. They're more blankets. EISENBERG: Yeah. Anyways, fun parody game - climate change, apocalypse. Next question. COULTON: Here's your next clue. (Singing, playing guitar) Here's the queen to remind you of this former kingdom of colonies. It seems fair. They revolted, like in Kenya, Egypt and India. And U, U, USA. KULSHRESHTHA: This feels personal. The Commonwealth. The United Kingdom Commonwealth. COULTON: Yeah, we'll take it. We were looking for the British Empire, which is bigger. But, yes, we'll take it. KULSHRESHTHA: I refuse to call them that. COULTON: No, I - absolutely. COULTON: I'm with you 100 percent. Well said. (Singing, playing guitar) Things seemed pretty well in 1922, then not quite as well until '91. Don't you forget about me, Mr. Gorbachev. See, I'm giving Yeltsin all of my former power. Now they can do as they please, those Eastern Blocky (ph) countries. This would make Marx and Lenin even more dour. COULTON: The Soviet Union. That's right. COULTON: (Singing, playing guitar) 'Cause the love that they shared wasn't spared from the air - dirty laundry. No divorce but annulled instead. A Tudor king who disagreed with the pope - quite a scope. Six weddings. Where was his head? Wife two's head. He chopped off her head. COULTON: We need the couple. EISENBERG: But we discussed we would also accept just Anne Boleyn because she also broke. COULTON: Also broke up, technically. EISENBERG: Also broke up. Yeah, exactly. COULTON: This is your last clue. (Singing, playing guitar) Well, did you ever notice that each land mass looks like a puzzle piece. They once were all connected in this most giant supercontinent - tec, tec, tectonic plates. COULTON: Roo. Thank you. Thank you very much. Roo. EISENBERG: It was back when you didn't have to take planes or boats. You could just drive everywhere. COULTON: (Laughter) It was just so much easier to get around. EISENBERG: Yeah, there was great trains. EISENBERG: Great game. Roo is in the lead. EISENBERG: If you met your significant other playing "Words With Friends" and now you're more than just friends, you should be a contestant on our show. Go to amatickets.org. Coming up, we'll talk to comedian Mo Amer. Earlier in the show, we played a smell-based game with Dascha. And soon, we're going to play a visual game with Mo. What's next - a game where you have to lick your radio? Mmm. Tastes like Ari Shapiro. I'm Ophira Eisenberg. And this is ASK ME ANOTHER from NPR.